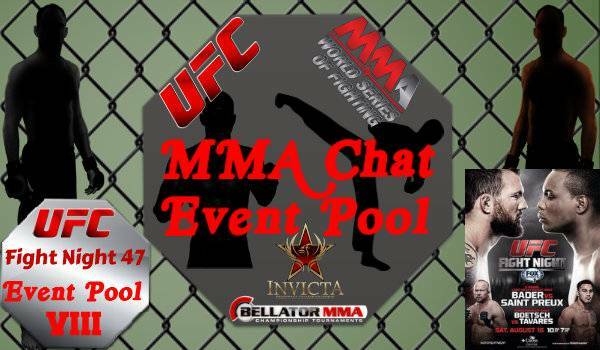 Fight picks must be entered in this thread by August 16, 2014 no later than 10:00 pm East Coast Time... one of the Mods will update the 1st post to log each player's picks. Updated Player Picks... don't forget to get your picks in ! Updated Player Picks... I'll get mine in a little while, I'm taking care of some things in the background. I thought Ticman vs. Saenz was a great fight ! Frankie Saenz defeats Nolan Ticman by Unanimous Decision with the judge's scorecards reading 30-27, 30-27, 30-27. Watson badly needed that win... I thought Alvey was gonna get the KO a couple of times there. For every 1 McMann lands, Murphy lands 2 to 4. Again... McMann on top, but Murphy outscoring from the bottom IMO.